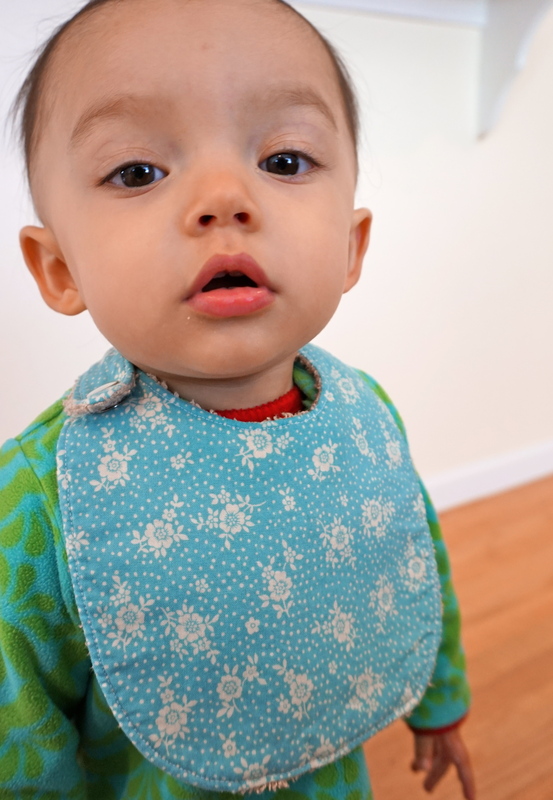 I’ve said before that bibs are sooo boring to sew, but they’re really a necessity with tiny ones. My 16 month old is pouring saliva everywhere with each tooth she cuts. The store bought ones just aren’t cutting it, and the 3 I made a year ago are still going strong. 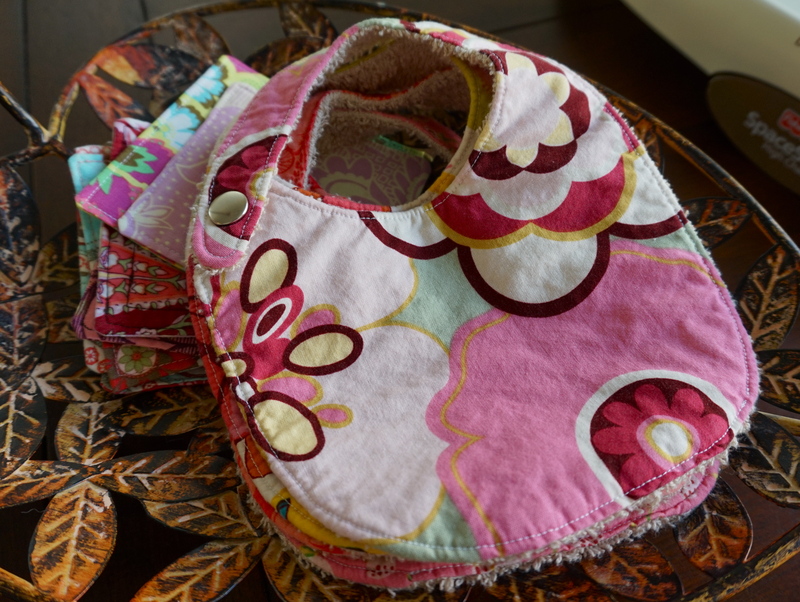 A couple of weeks ago I whipped up 5 new bibs. 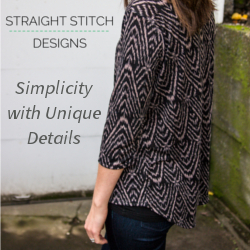 I love this project because they use up the larger scraps (by larger I mean larger than a quilting scrap, smaller than a fat quarter) I have taking up space. I have a few scrapbuster projects I love to make that uses up these weird sizes, all of which I’ll share at some point, but it’s nice to use some of my favorite scraps in a way that I’ll get to look at all the time! I used this pattern for the bib , but there are sooo many free bib patterns out there, you just need to find the one you like. 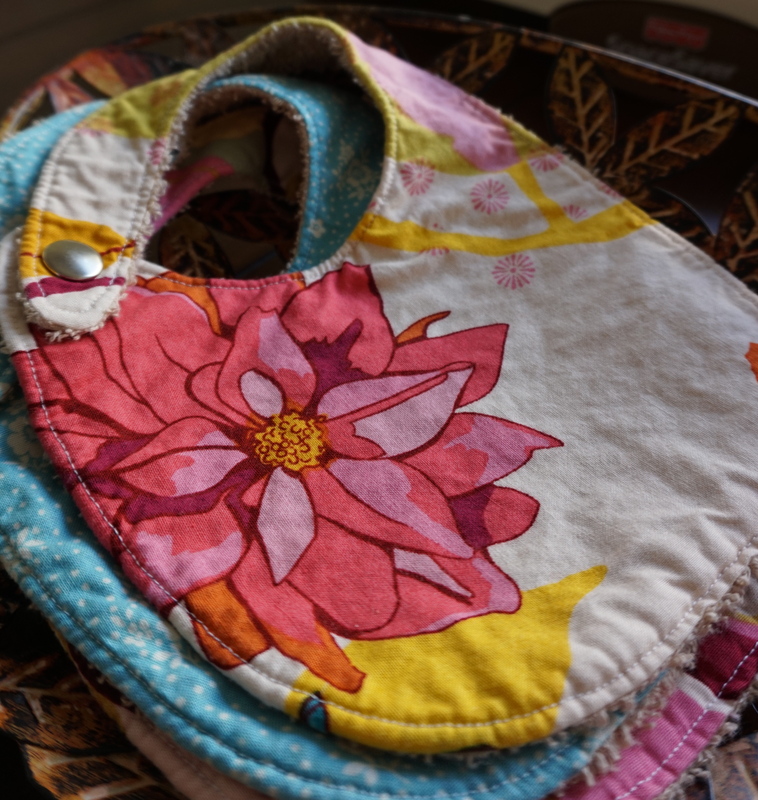 I wanted simple bibs that highlighted my favorite prints, no frills. Plus, I wanted these to be a quick project. Using my pattern, I cut one out of my fabric and one out of toweling (I bought the towel in the clearance section of a department store). 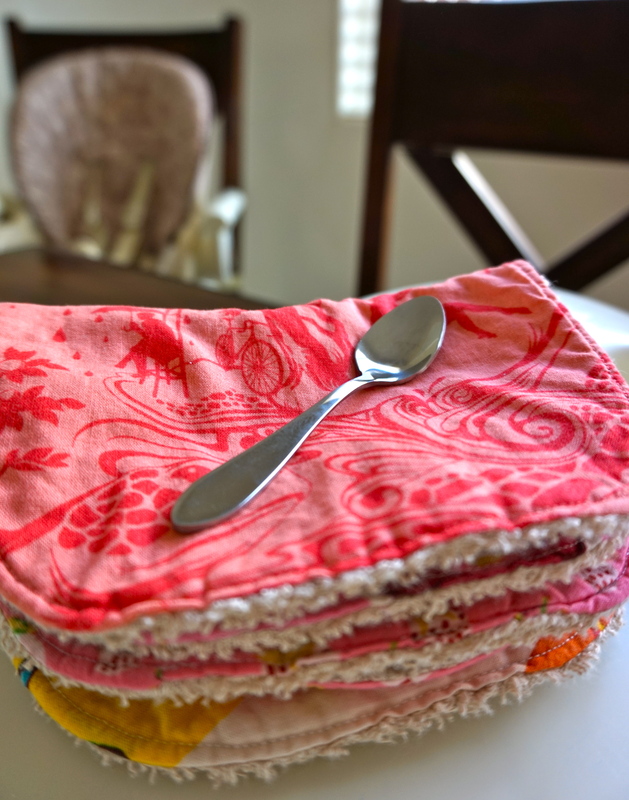 I was able to cut 9 bibs out of the bath towel which made each bib very inexpensive. I placed the towel and the wrong side of my fabric together, sewed all the way around leaving a 2″ opening at the bottom. I used a 1/4″ seam allowance, and at the curves lifted my presser foot and turned a little at a time, using the hand crank. Then I turned it right side out and top stitched close to the edge, closing up the opening at the bottom. I used heavy duty snaps because the bibs are thick. You could also sew on velcro, but my daughter loves to pull them off, so snaps keep them on her neck. They’ve been working out very well and absorb lots of drool, keeping her chest dry and rash free! She is not having an easy time with the teething, poor thing.